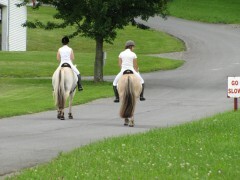 Oh how I love going to the Finger Lakes Fjord Show! 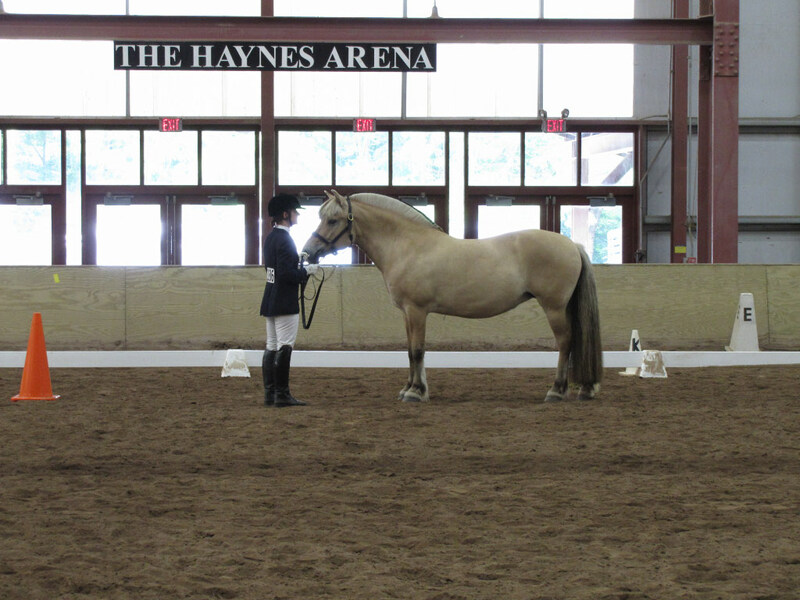 I can’t go to Finger Lakes without being reminded of Julia Will, a wonderful friend of both ours and the Fjord breed, who passed away in September 2002. To me Julie’s spirit suffuses the show and being there surrounded by the beautiful people who loved Julie as much as we did, and the horses on whom she had so much influence, is uplifting to my spirit. 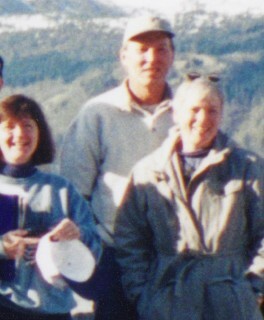 I met Julie in 1998, felt an immediate connection to her, and was able to travel to Norway with her and Darryl twice, learning so much about the breed through her contacts and her experience. When Julie left this world after a courageous battle with cancer it was like I had known her a lifetime, and although she was at peace, I was not ready for her to go. I think of her often and still have times I wish I could ask her advice. Julie was kind, honest, dedicated to the breed, and had a spirit of service that I found inspirational. It had been far too long since our summer schedule has allowed us to venture down to upper New York State for the Finger Lakes show. This year, with our intern Janina Klingelhoefer being here from Germany, we really wanted to make it happen. The date was free of other obligations, my passport arrived the week before, and everything just kind of came together for us to go. 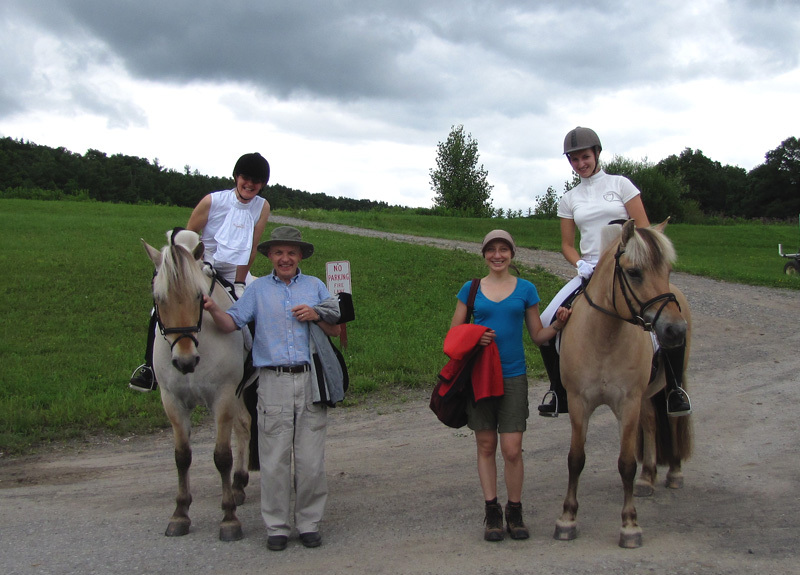 We set off with two horses, our gelding Ooruk and mare Bluebird Lane Kestrel. The plan was that I would show Ooruk and Janina would show Kestrel. Stefan was there to provide his invaluable help and support, and my student Elena Shmoylova also traveled down after work on Friday to groom and help out. 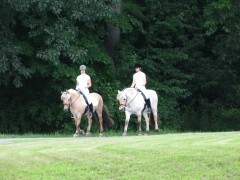 Our Bluebird Lane team of two horses and four people was fit and ready! 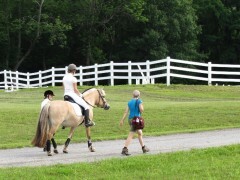 Our travel time with horses from home to the show came to nine hours exactly. We drove past the exit to the former show grounds in Weedsport somewhat wistfully, to travel another hour to the new location south of Syracuse. 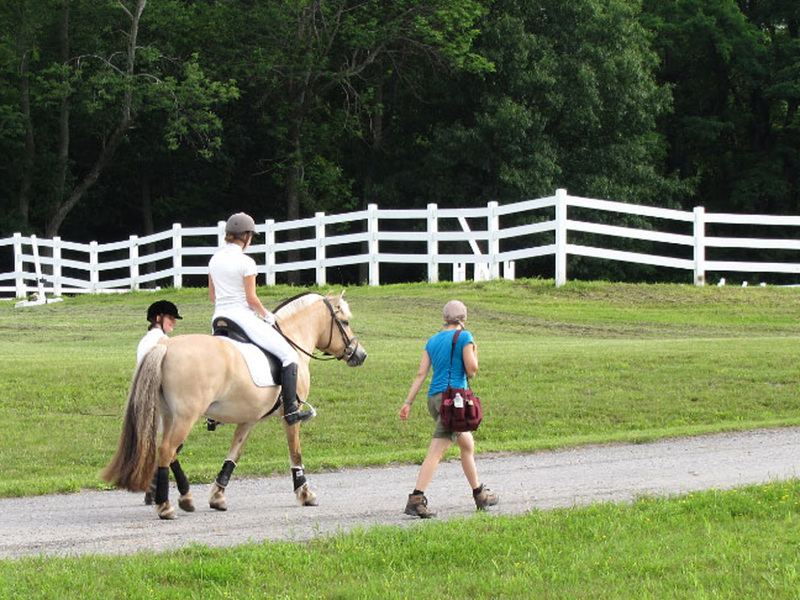 The extra hour’s drive was worth it though, as the venue at the Cazenovia College Equine Center was lovely. 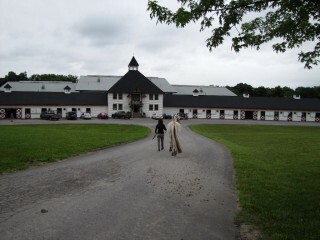 Beautiful, safe stabling, good footing, and an enormous indoor arena made it a pleasure to show at this facility. And we couldn’t have asked for better results. 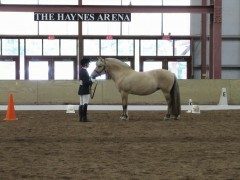 Our mare Kestrel won first place in the Mares Halter Class, and then went on to win the Overall Halter Championship! Woo Hoo!! I just love that horse. Janina did a great job of exhibiting her, and Kesi just shone. 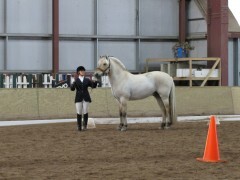 I presented Kestrel in the Julia Will Breeder’s Challenge. 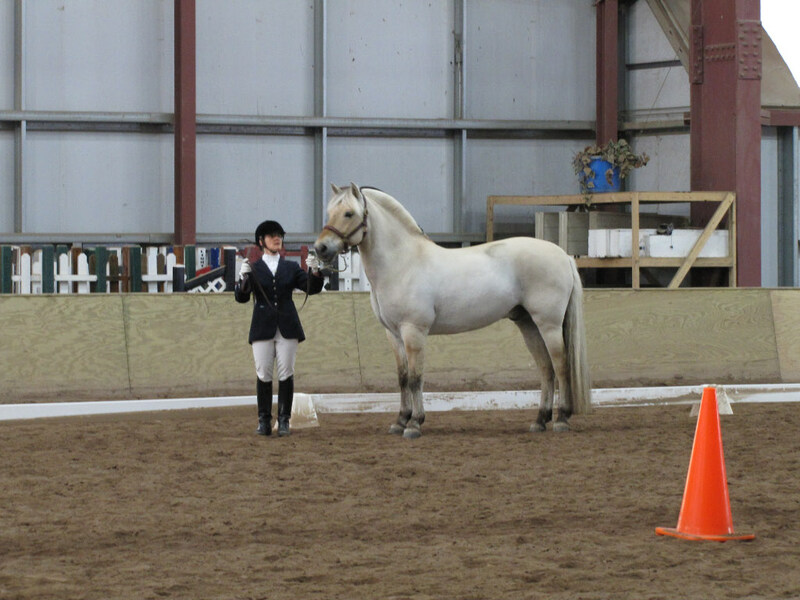 This special class was set up to honour the contribution that Julie made to the breed, and in it a breeder could exhibit a horse that they bred themselves and still own. It meant so much to me when my beautiful Kesi was awarded the trophy, which is now proudly displayed in my “Hall of Fame”. 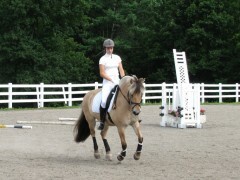 We continued on with fantastic results in our riding classes. 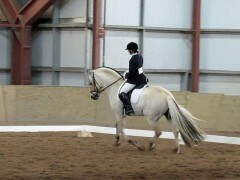 I was proud of Janina and Kestrel, who in their first dressage test together achieved a 68.4% in Training Level Test 3. 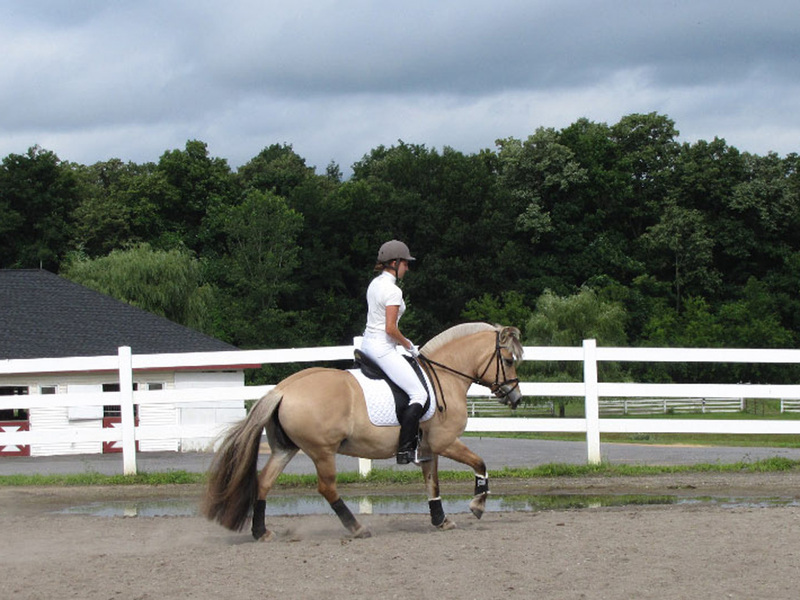 After coaching Janina through her warm-up and watching her test, I jumped on Ooruk, who Elena had standing ready. We had only a brief 15 minutes (tops!) 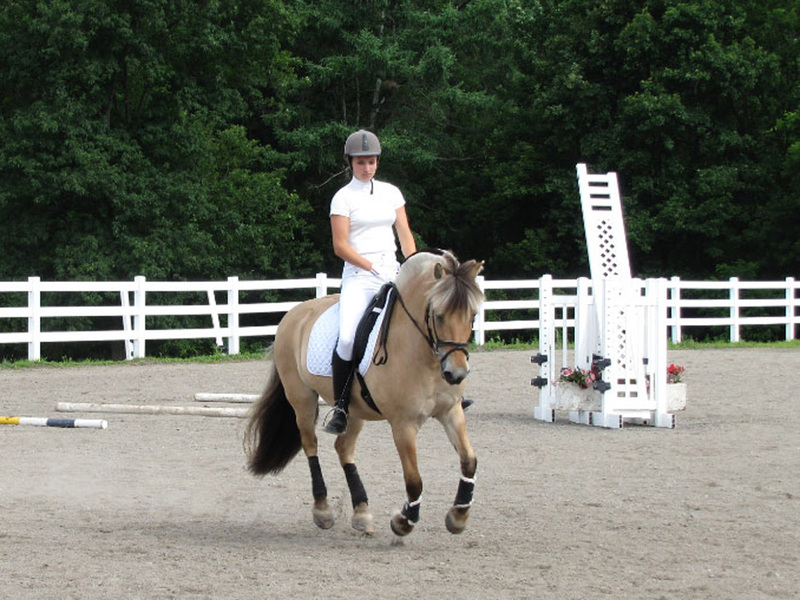 warm-up and then went in to ride our Second Level Test 3 for a score of 69.3%. Super nice comments from the judge on both horses rounded out our happiness with the rides. In the ring classes we were showing against each other, and our horses took first and second place in every class. Ooruk and I won the Pleasure and Dressage Suitability, Janina and Kestrel won the Equitation, and we ended the day as Champion and Reserve respectively in the Ridden Division. 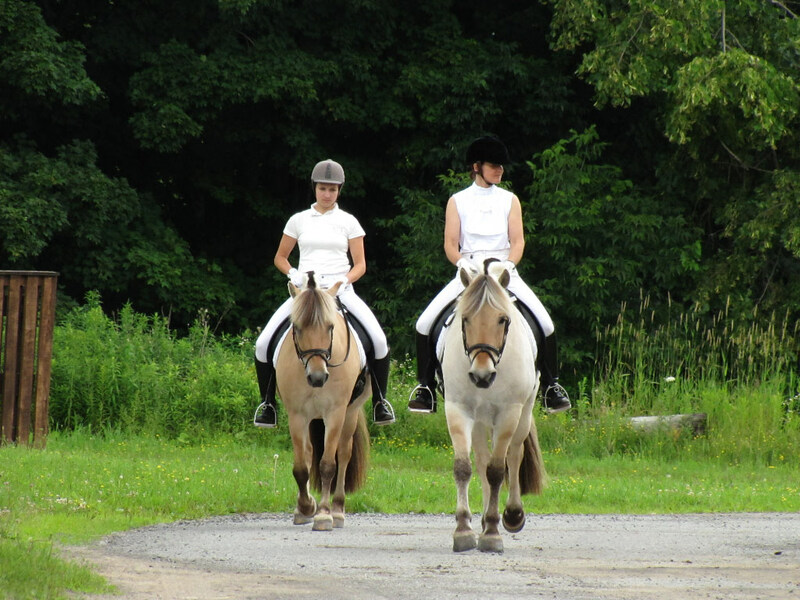 We were hot and sweaty in the humid weather wearing our black wool jackets, but smiling and happy with our horses’ performances. 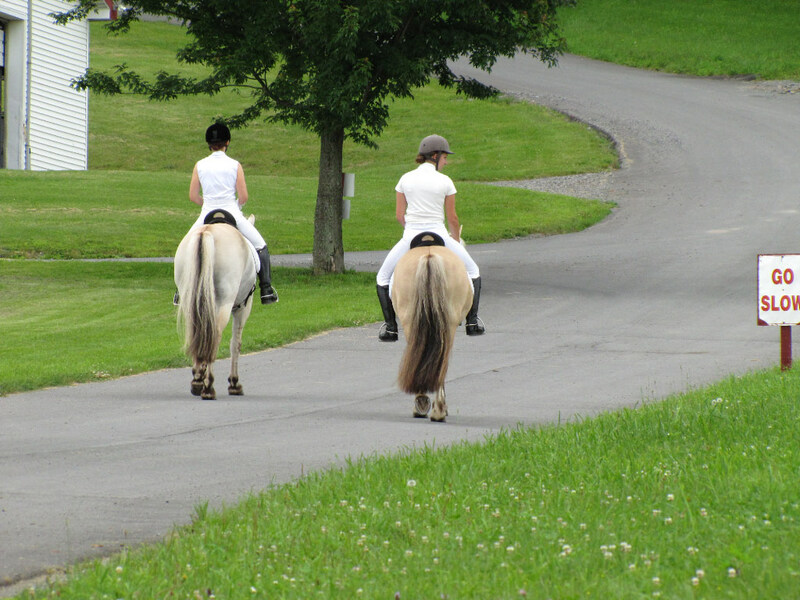 And how about those tails? We had booked rooms over the Internet at a bed and breakfast in nearby Fayetteville. On our arrival Friday night we found the home bore some resemblance to the Addams Family residence, with it’s myriad of nooks and crannies all stuffed to the gills with antiques and oddities galore. 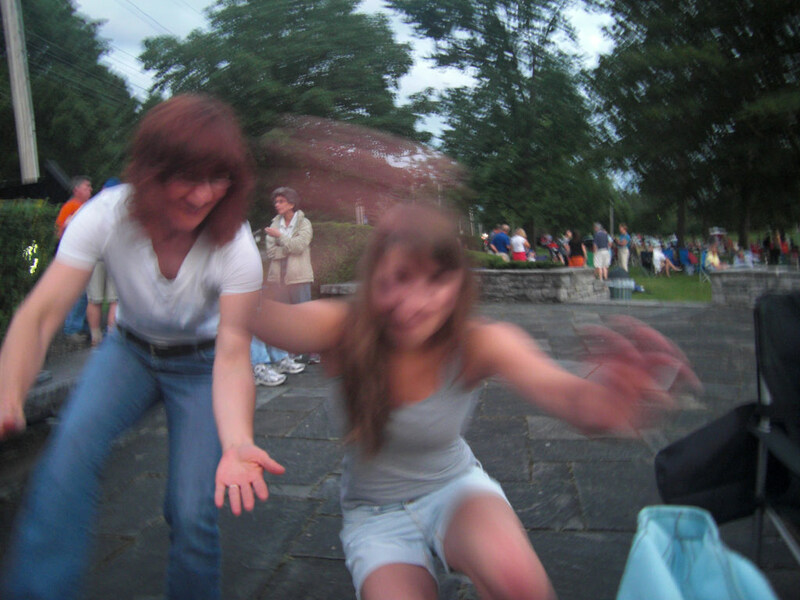 Henceforth we fondly referred to our home-base as the haunted house. The owners of this charming B&B were more than accommodating of our crazy horse-show hours, and kept us well-fed and comfortable. We finished up our show day in ample time to head back to the haunted house for showers. Ah yes, the post horse show shower really is the sweetest shower of all! We then set off to enjoy a nice meal at a nearby restaurant within easy walking distance. 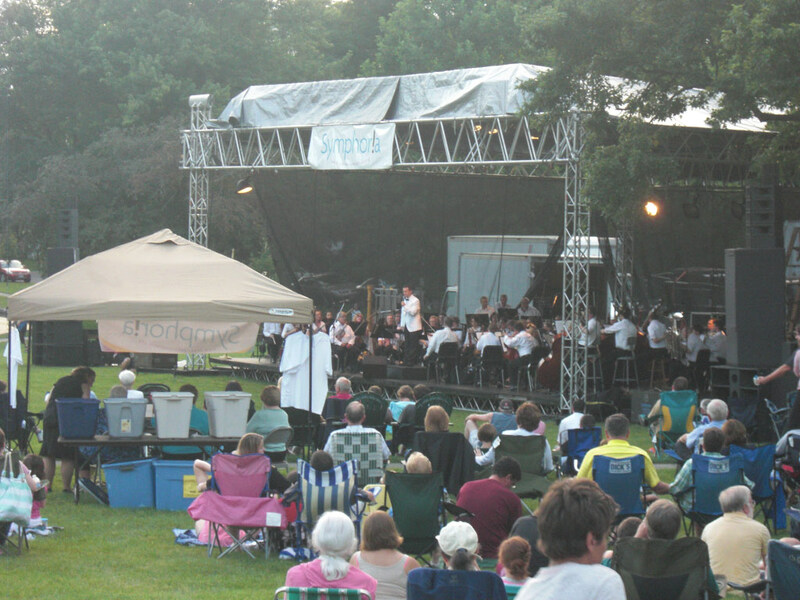 The owners of the B&B had let us know of a free concert being staged outdoors at the park another short walk away, so after dinner, we headed over there to watch the “Symphoria” concert. It was fantastic! 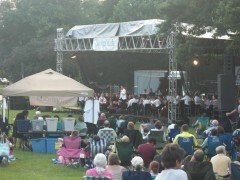 A collection of pops and show tunes were presented by the professional Symphony of upper NY state. 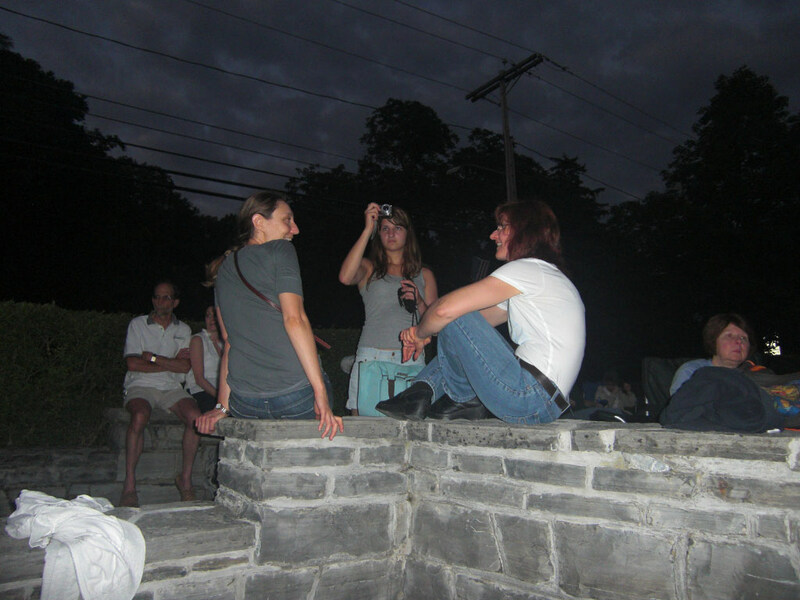 We had a great view seated up on the stone wall, and enjoyed the soft warm evening air, the energy of our fellow patrons, and the gorgeous music. Practicing our one-legged squats during intermission. Because, doesn’t everyone? 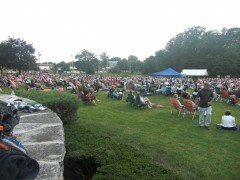 Lots of people at the show! It truly had been a perfect day. 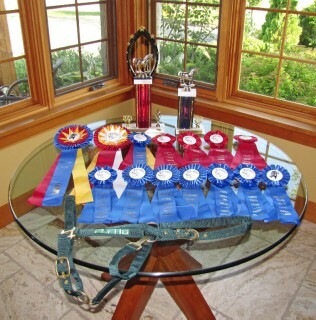 Thanks so much to the Finger Lakes Fjord Show organizers and our fellow competitors. Everyone did a fantastic job!